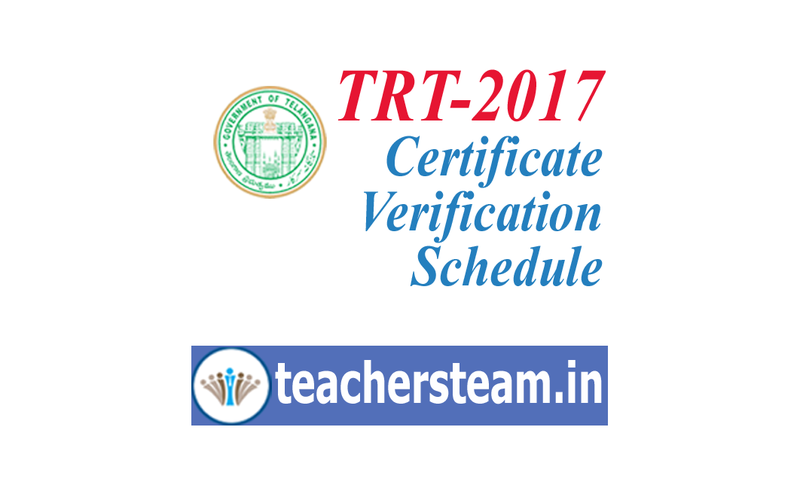 In view of the fillling of vacant teacher posts in Telangana, through Teachers Recruitment Test 2017, TSPSC Has announced the TRT Certificate verification schedule. It is hereby informed that, on the basis of OMR/CBRT Examinations held from 24/02/2018 to 04/03/2018 FN & AN to the Post of School Assistant BIOLOGICAL SCIENCE (T/M) notified vide Notification No.52/2017 for a total of 282 vacancies in School Education Department, the 62 candidates were provisionally picked up for 2nd spell of Certificate Verification. In continuation to Result Notification dated:19/06/2018 and 20/08/2018 to the post of School Assistant BIOLOGICAL SCIENCE(T/M) the following 62 candidates were provisionally shorted listed for certificate verification on the basis of OMR/CBRT Examinations held from 24/02/2018 to 04/03/2018 FN & AN notified vide Notification No. 52/2017 for a total no. of 282 vacancies in School Education Department. The candidates with the following Hall Ticket Numbers are provisionally picked up for 2nd spell for want of eligible candidates in Communities/categories/ District. The candidates who were called for Verification of Certificates have to produce the following certificates in original along with a set of Photostat copies duly attested by Gazetted Officer at the time of Verification of Certificates, failing which, they will not be admitted in subsequent process of selection. No request will be entertained for subsequent submission of any of the required certificates. In terms of the Notification, the candidate should possess the requisite qualifications as on the date of the Notification. The Commission reserves right to disqualify any candidate, if she is not found eligible for any reason at any stage. Admission to Certificates Verification does not confer ipso facto any right for Final selection. Candidates are instructed to bring all the required original certificates as per the TRT-2017 notification. List of Hall Tickets can be downloaded from the below attachments.